Simplicity is the best form of design. A lot of times in this the age of ever-more complex technicality, we become bogged down in extraneous nuances. Sometimes, we just want to turn on and go. The new REV’IT! Voltiac Jacket is built for the seasonal touring-oriented motorcyclist who just wants something simple that can be thrown on and cover the basics. Constructed of a 600D polyester outer for abrasion resistance and equipped with Knox Flexiform CE protection at the shoulders and elbows (back sold separately), this jacket is ready to offer the requisite moto-functionality that would be expected from the REV’IT! brand. This jacket is also waterproof and insulated to handle the varying climatic conditions that sometimes arises on the road. Simple in design and not loaded with an arsenal of intricate features, this jacket is great for the daily commuter who is not in need of every bell and whistle available. In simplicity there is peace. 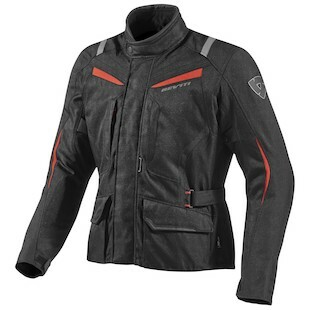 If you are a rider who is looking for ease of use in a motorcycle jacket equipped for a wide range of weather and riding conditions, check out the REV’IT! Voltiac Jacket.